Read and comment on this editorial from the Minneapolis Star Tribune that the Peace Corps has a strong ally in President Bush and his efforts to increase the corps budget and expand the number of corps volunteers to 14,000 by 2007. The United States needs efforts like the Peace Corps to spread understanding of the United States and bring people to appreciate that the nation is more than aircraft carriers, tanks and infantry. But as Bush embraces the Peace Corps, it's difficult to understand his acquiescence in the destruction of the corps' domestic equivalent: AmeriCorps. As the old saying goes, talk is cheap. What AmeriCorps and Teach for America need from Bush is action to match the rhetoric. Editorial: AmeriCorps / Why treat it badly, Peace Corps well? When President Bush arrives in Minnesota today for a fundraiser, he also will make time to honor two Minnesotans who have volunteered for a Peace Corps assignment in Turkmenistan. Jane and Edward Bardon surely deserve the recognition. Jane Bardon is 68, husband Edward Bardon is 70. At an age when many people are slowing down in life, they continue to embrace adventure and service in a faraway country that can use their help. There's a special reason Bush chose St. Paul and the Bardons: Sen. 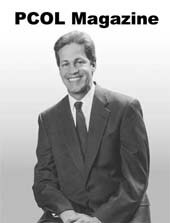 Norm Coleman is chairman of the Senate subcommittee that oversees the Peace Corps -- and a strong ally of Bush in the president's effort to increase the corps budget and expand the number of corps volunteers to 14,000 by 2007. Good for Coleman and for Bush. The United States needs efforts like the Peace Corps to spread understanding of the United States and bring people to appreciate that the nation is more than aircraft carriers, tanks and infantry. But as Bush embraces the Peace Corps, it's difficult to understand his acquiescence in the destruction of the corps' domestic equivalent: AmeriCorps. When Bush came to office, AmeriCorps was running a surplus, had a growing membership and had won over elected officials at every level of government. What's more, several independent reviews of the agency had rated its performance outstanding. Indeed, Bush was a supporter. During the 2000 campaign, he expressed strong support for Teach for America, one of the programs in the AmeriCorps portfolio. So struck was he by this program, which recruits the brightest college students to teach in America's toughest neighborhoods, that Wendy Kopp, founder of Teach for America, was invited to join First Lady Laura Bush for the president's 2001 budget address to Congress. In his 2002 State of the Union address, he praised AmeriCorps to the heavens and promised to expand it by 50 percent. The situation, however, changed quickly for AmeriCorps, for Teach for America and for other nonprofits that depend on AmeriCorps for funding. The trouble started when Bush, in his first budget, failed to ask Congress for money to refill the AmeriCorps trust fund, which pays for the education benefits members receive. Then came Sept. 11 and Bush's call for Americans to step forward to serve, a call many young people heeded. Then came his call for a 50 percent expansion of AmeriCorps. Finally, and fatally, the management team Bush appointed to run AmeriCorps got ahead of itself and sought to meet the expansion goal a year ahead of schedule. The result: AmeriCorps recruited 20,000 more members than it could afford. In two years, the agency went from surpluses to deficits and from praise for its management to charges of incompetence -- all on Bush's watch. The upshot is that AmeriCorps zeroed out Teach for America for 2003. It will get nothing additional with which to pay its teachers the living stipend and educational benefits they were promised. Its corps of teachers will drop from 2,400 to 575. There is a way out: A bill passed the Senate that would provide $100 million in supplemental appropriations for AmeriCorps this year, solving its problem. But in the House, that money was stripped from the bill by House Majority Leader Tom DeLay, who saw an opportunity to gut a program he has never liked. Bush has said he'd like the money restored, but so far he has appeared unwilling to spend the political capital necessary to get the job done. The showdown will come when Congress returns to Washington this fall. As the old saying goes, talk is cheap. What AmeriCorps and Teach for America need from Bush is action to match the rhetoric. Does he believe in these programs or doesn't he? 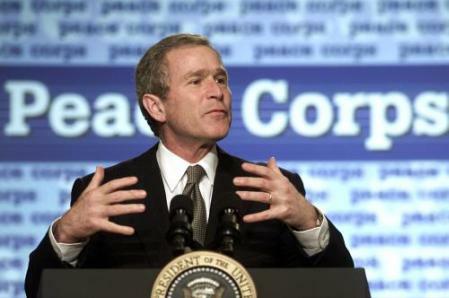 And if he doesn't, how much of what Bush says in Minnesota today can the Peace Corps take to the bank? August 18, 2003 - Who killed Teach for America? Read and comment on this op-ed piece from Time Magazine on August 18, 2003 by Politial columnist Joe Klein about Teach for America (TFA), the exemplary national-service program that sends recent college graduates to teach for two years in the poorest urban and rural school districts. One year ago many were optimistic that Teach for America, one of the flagship AmeriCorps programs, would have a future in a Bush Administration. Indeed, TFA head Kopp was invited to sit in the First Lady's box at Bush's first budget message to Congress in February 2001. On July 11, however, a form letter arrived in the Teach for America offices from the Corporation for National and Community Service. "We regret to inform you," it said, "that your application was not selected for funding." Most AmeriCorps programs were facing severe cuts. But Teach for America's fate was far more drastic; it had been zeroed out, eliminated. "We are no longer an AmeriCorps program," Kopp said. "There is a legitimate philosophical difference here, and it involves the difference between voluntarism and service. Voluntarism is the act of doing valuable things that fall just outside the normal scope of governance. Service is more intense: it is a full-time commitment to do the most difficult public works�policing, teaching, social casework. The Police Corps, which exists outside AmeriCorps, and Teach for America are exemplars of the latter. They are unabashedly élitist; TFA accepts only 13% of all applicants. They involve rigorous training programs. And the goal is to leverage the altruism of the best and the brightest college students, putting them to work on the toughest jobs in the toughest neighborhoods�and, in the process, to help create a new generation of leaders like the "Greatest" generation, imbued with the spirit of sacrifice." Viewpoint: Who killed Teach for America? "Everyone came out of that room glowing," said Wendy Kopp, the founder of TFA. "He really understood education and cared about what we did. He sounds like us, one of our teachers told me." Kopp was optimistic that TFA, one of the flagship AmeriCorps programs, would have a future in a Bush Administration. Indeed, Kopp was invited to sit in the First Lady's box at Bush's first budget message to Congress in February 2001. At the same time, Teach for America was designated as one of five education and literacy programs that would receive special attention and support from Laura Bush. n 2002, the President in his State of the Union address called for increased national service and then illustrated what he meant by visiting a Teach for America school in Atlanta. "I am proud to stand up and talk about the best of America and Wendy Kopp," the President said. "I hope young Americans all across the country think about joining Teach for America." Last January Teach for America received a $2 million "challenge grant" to facilitate the expansion. But about that same time Kopp began to hear that AmeriCorps' priorities had changed. Programs that encouraged voluntarism would be favored over so-called professional corps like Teach for America. She says she was assured by John Bridgeland, the Bush voluntarism czar, that Teach for America's annual grant from AmeriCorps�about $12.5 million in scholarship money and $1.5 million for operating expenses�was safe. On July 11, however, a form letter arrived in the Teach for America offices from the Corporation for National and Community Service. "We regret to inform you," it said, "that your application was not selected for funding." "We were shocked," Kopp told me. "There had been no warning." To be sure, Kopp was aware that the rest of AmeriCorps was being squeezed because of a bureaucratic accounting snafu and congressional reluctance to rectify the error. Most AmeriCorps programs were facing severe cuts. But Teach for America's fate was far more drastic; it had been zeroed out, eliminated. "We are no longer an AmeriCorps program," Kopp said. Why has this happened? It's difficult to say. I spent much of last week having Orwellian conversations with functionaries at the Freedom Corps and the Corporation for National and Community Service. "This shouldn't perceived as a lack of support for Teach for America," one told me. "There's a grant process, and they didn't succeed." But it does seem that TFA was axed because it doesn't encourage community volunteer work; its members merely teach school in poor neighborhoods. There is a legitimate philosophical difference here, and it involves the difference between voluntarism and service. Voluntarism is the act of doing valuable things that fall just outside the normal scope of governance. They are unabashedly élitist; TFA accepts only 13% of all applicants. They involve rigorous training programs. And the goal is to leverage the altruism of the best and the brightest college students, putting them to work on the toughest jobs in the toughest neighborhoods�and, in the process, to help create a new generation of leaders like the "Greatest" generation, imbued with the spirit of sacrifice. "Maybe there should be a separate funding category for professional corps," said Stephen Goldsmith, the chairman of the Corporation for National and Community Service, who added that he was not pleased that Teach for America had been defunded. "The grant selection process was narrow and quite bureaucratic, and we're going to have to review it. We'll try to get this rectified in the 2004 budget year or before." Meanwhile, Wendy Kopp has 3,200 TFA members recruited so far who will not be receiving scholarship money this year. More broadly, AmeriCorps itself faces a reduction from approximately 55,000 to 35,000 members. Just before the summer recess, the Senate passed a $100 million appropriation to restore these cuts, but House majority leader Tom DeLay�who has made no secret of his desire to kill AmeriCorps�blocked the money. The President says he wants these funds restored, but he doesn't seem to have much control over the powerful DeLay. Even if Bush means what he says, Teach for America has been axed for 2003. I called the First Lady's office to see what she thought about that. She was unavailable for comment. Joe, Unfortunately, Clinton's program was targeted and bushwacked. Those phone calls will go unreturned. Talk is cheap, watch his feet.